Hrithik Roshan and Katrina Kaif 'Bang Bang' will have some killer, rare action sequences. Hrithik Roshan and Katrina Kaif were spotted shooting in Shimla. Bollywood actor Hrithik Roshan and Katrina Kaif ‘Bang Bang’ will have some killer, rare action sequences. The action sequences that will be shot in Abu Dhabi will be designed by the ‘Amazing Spider Man2’ stunt director Andy Armstrong. Hrithik Roshan got back in action after a long break with the shooting of Siddharth Anand’s ‘Bang Bang’ in February. The ‘Zindagi Na Milegi Dobara’ actor had to delay the film’s shooting due to his brain injury, which he had sustained last year while doing some stunts for ‘Bang Bang’. ‘Bang Bang’ got delayed as Hrithik Roshan was recuperating from his brain surgery in July 2013. 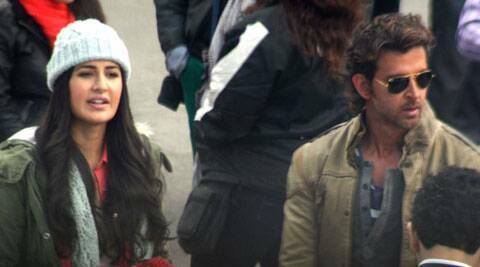 Lead actress of the film Katrina Kaif was last seen in Shimla shooting for ‘Bang Bang’ with Hrithik. ‘Bang Bang’ is an upcoming action-thriller-romantic film directed by Siddharth Raj Anand. The film is being produced by Fox Star Studios and is a remake of the Tom Cruise-Cameron Diaz film ‘Knight and Day’. ‘Bang Bang’ is slated to hit the theatres on October 2, 2014.